Dr. Narayan Bahadur Basnet writes…. 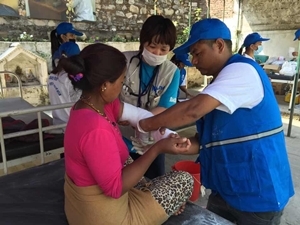 4 May 2015 Nepal..
AMDA Nepal has been providing emergency medical relief to earthquake victims in Nepal since 26th April 2015 with the technical and financial support from AMDA International (HQ), Okayama, Japan. 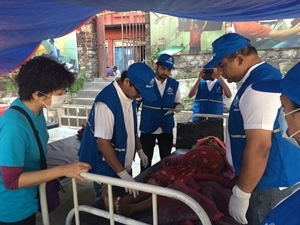 Team#1 of AMDA has been working since 26th in different places (Dobidhara, Sankhu, mobile) in Kathmandu valley lead by Dr Saroj Ojha, the chairperson of AMDA Nepal. 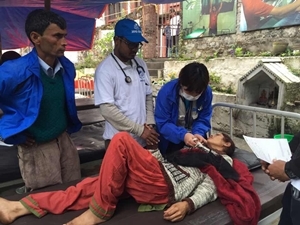 Today on 1 May 2015, a 5 member team lead by Dr Narayan Basnet, is distributing safe drinking water, ready to eat food, medicine and other relief material to the people staying under the temporary tent. Most of the people staying under the temporary tent are mostly affected by the earthquake. Their home is no more suitable for shelter. Team#2 is working in Sworpani VDC, Pokhari Danda, Gorkha district lead by Dr. Santosh Pokhrel. There are total 8 members from AMDA. It is close to centre of earthquake (Warpak). This team has established their clinic about 3 hour drive and estimated 5 hour walking from the district headquarter. AMDA team member were supported by Nepal Army and Armed Police Force (APF) to reach the site by helicopter at first. It is very hard to get contact with them. Two of team member are sheltering in their own vehicle at Jyalla, on the way to clinic. 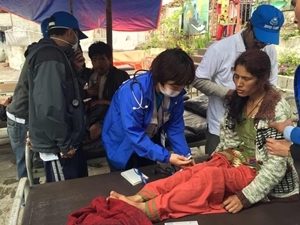 They are managing supply of medicine and communication with the AMDA Nepal office based in Kathmandu. 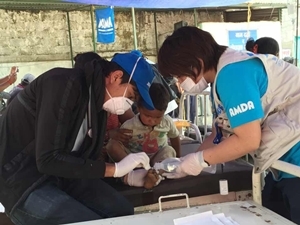 AMDA Nepal is trying collect several information (safety situation of AMDA team, food, accommodation, number of survivor supported/treated, logistic need etc). It is expected that team are being accommodated in the camp established by the Nepal Army and APF. It is reported this morning that first aid is almost covered in this area. People are asking Shelter and Food to eat. This team may return early morning tomorrow to coordinate with the district public office at the district head quarter for the further planning and support. 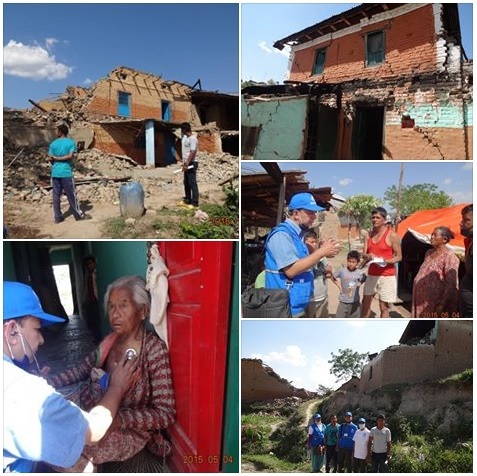 Team#3 lead by Dr Nabin Dhakal is working in collaboration with Sindhu Community Hospital at Khadichour, Sindhupalchowk, since 29th April 2015. Kandhichour is about 80 KM far from Kathmandu. There are total 8 person in team#2 from AMDA including MS Omasa and Ms Shibata from AMDA HQ. This team is asking more medicine for the treatment of facture (orthopedic) cases. It is reported that total 35 person treated in this clinic as of 4 pm on 30th April 2015. Further, AMDA has approached Tribhuvan University Teaching Hospital (TUTH ) in Kathmandu for the collaboration with AMDA in the extended health clinic to be established Chautata, Sindhupalchowk to be lead by TUTH. A team lead by Dr Suganami from AMDA HQ met TUTH director for the possible collarotation. Dr. Suganami together with Dr Saroj is going to Sindhupalchowk to support on-going relief work and access the situation in Chautara, tomorrow. Summarizes the activities of the 28th. Share, fundraising help, thank you for your thank you! Three doctors and two nurses from Siddhartha Children and Women Hospital in Butwal that is run by AMDA Nepal, were dispatched to Gorkha District tonight. It is a long journey for the medical team. 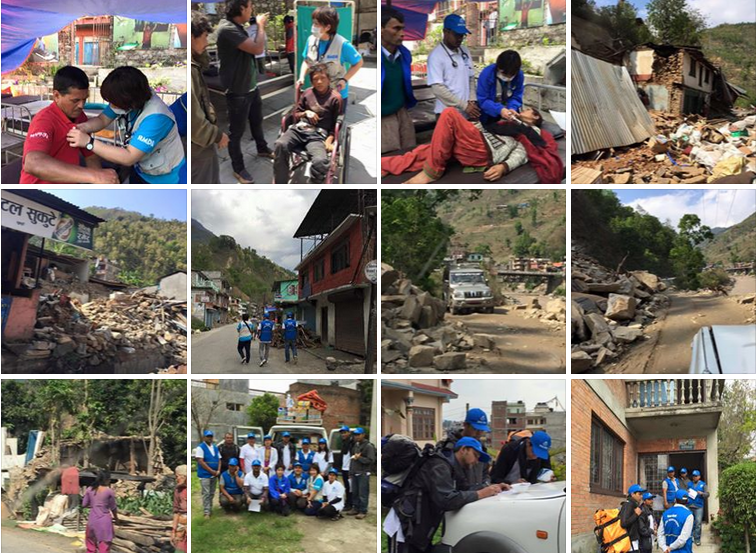 More than 10 hours by car, and 3-6 hours walk to reach the disaster-stricken area. 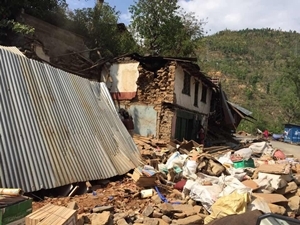 None of the international aid have reached Gorkha District just yet as it is hard-to-access area. They have zero internet access, but we will post the photos once we receive them. Thank you for your patience. 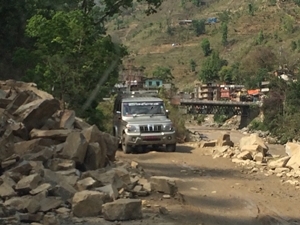 There were reports and Boutwell operated by Nepal AMDA chapter Siddhartha mother and child hospital, 3 doctors and 2 nurses tonight 7 pm (local time), for the Gorkha District departed from.Departure toward the village was isolated in the region after the disaster, still not been reach helping hand support. Land about 10 hours, and then walk in 3-6 hours, to enter the disaster area will. Local no Internet access for photography will be at a later date, but will improve as an activity report becomes available. Please note that. They have zero internet access, but we will post the photos once we receive them.